natalie's sentiments: Things making me happy this week. I've been eyeing this hutch for literally years. Finally I told Shane to go pick it up. Now I'm kicking myself for waiting so long. Isn't it perfect there??? I'm loving my new kitchen paint too. Shane had it all done when I came home from Spokane. Now I need to think about painting the living room. Any ideas? Are the hydrangeas too much? I think I like the hutch better with nothing on top, but I really have very little eye for these kind of things. Look at the lovelies that showed up in the mail this week! Usually I only participate in one blog swap a year, but when I saw that Modblog was having an accessories swap, I had to join up. You know I'm addicted to jewelry. (By the way, I'll be hosting an awesome jewelry giveaway next week.) My swap partner Anna, sent me this darling handmade friendship bracelet in my signature color, and this amazing necklace! I made the earrings to match. 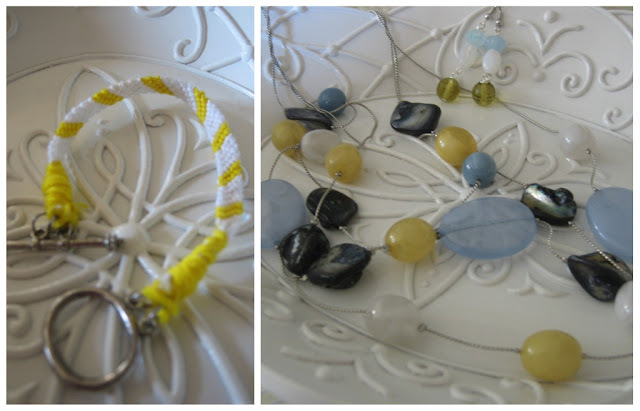 I'll change up the yellow beads to match closer once I find some. Thank you Anna! Now adorning my fridge is Lydia's new masterpiece. A painting of she and her preschool "boyfriend". 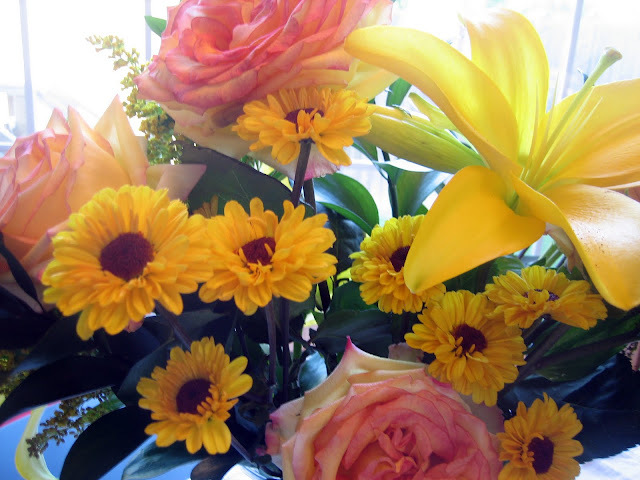 I love fresh flowers on my kitchen table. I like them even more when they are "guilt flowers" from Shane admitting he was wrong in an argument. That's just double satisfaction. He He He. 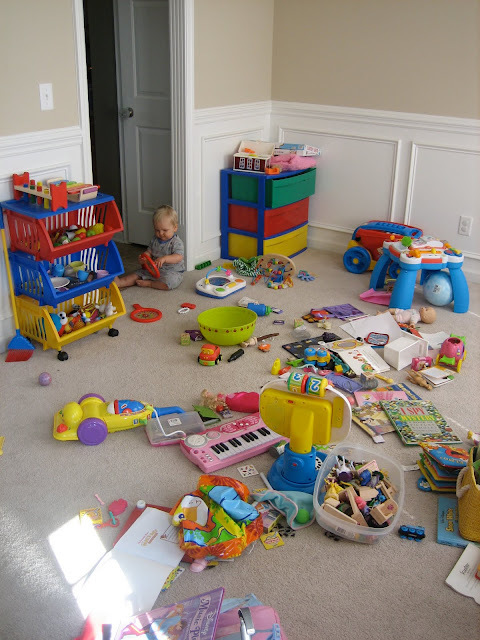 And lastly...., this room is now clean!!!! Hurray! 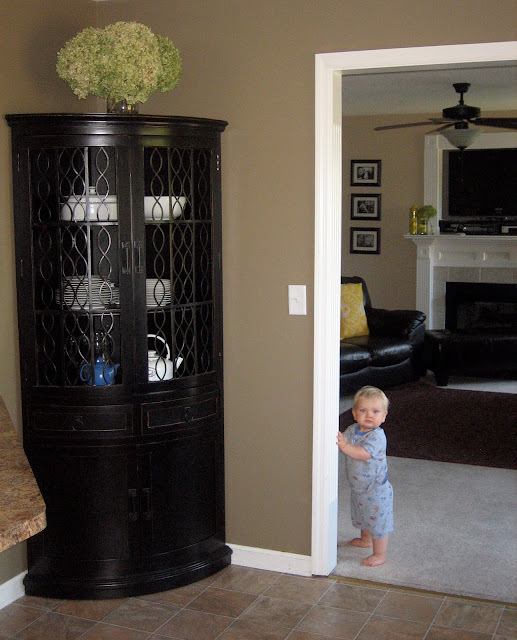 i love the hutch, and i think the hydrangeas draw the eye up the entire piece so that you really take it all in. they look great. OMG I LOOOOOOOHUVE! The hutch! I thonk our boys are around the same age (13 months?). Is he walking? I'm at my in-laws for a couple of weeks and they're practically forcing him to walk. I'm like, why do you want him to walk so bad??? I want him to stay a baby for as long as I can keep him that way. ps. love the corner hutch, those seem hard to come by so you're a lucky duck. OMG - that hutch is PERFECT! I LOVE IT!! I think it's great with the flowers atop. Lydia is gorgeous! What a cutie! I also love the hydrangeas on the hutch. It definitely gives it a finished look to have something on top. At least somebody got that beautiful piece of furniture. YEARS is waaay too long to look & drool at the thing every time I go in that store. Enjoy it. Looks fab. The flowers totally work too. The paint looks like it has a grey undertone...go for a pale pale pale yellow with a big bold stripe around the room in your kitchen color. Or call MJ and she can give you some "professional" suggestions!! I love it! And the hydrangeas definitely work. I could see a pumpkin up there in the fall, maybe. I came across this cute kids' room and thought of you, with your yellow and gray obsession.